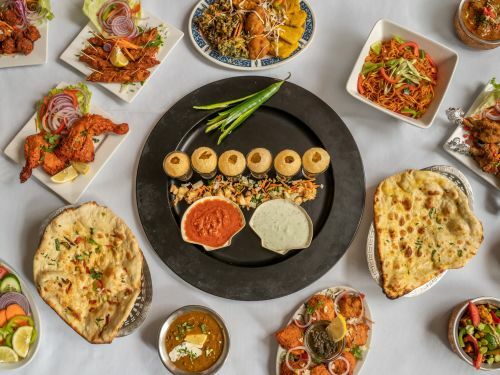 Menulog delivers for Spirit of India - Preston so you'll be able to track your courier on a map. 2 pieces. Homemade pastry stuffed with potatoes and peas. 4 pieces. Onion fritters dipped in mildly spiced lentil flour batter. 4 pieces. Spinach dipped in lentil flour batter. 4 pieces. Cottage cheese cubes dipped in lentil flour batter. 5 pieces. Freshly grated vegetables rolled in corn flour, shallow fried and sauteed in Manchurian sauce. 2 pieces. Homemade pastry stuffed with potatoes and pan-roasted minced lamb. Lentil in light curry soup. Fresh tomato in light curry soup. Marinated cauliflower roasted in tandoori oven. Marinated mushroom roasted in tandoor. Green capsicum stuffed with cottage cheese, potatoes and dry fruits, roasted in tandoor. 4 pieces. Marinated breast of chicken barbecued in tandoor. 4 pieces. Marinated breast of chicken in garlic and yoghurt, roasted in tandoor. 4 pieces. Marinated chicken cooked in tandoor. 4 pieces. Marinated thigh fillet roasted in tandoor. 4 pieces. Minced lamb blended in herbs, skewered and cooked in oven. 4 pieces. Tender lamb pieces marinated in yoghurt and roasted in tandoor. Marinated in yoghurt, herbs and spices, roasted in tandoor. 4 pieces. Rocklin fish rolled in lentil flour and spices, then deep-fried. Fresh mixed vegetables cooked in korma sauce. Wok tossed fresh mixed vegetables. Fresh mixed vegetables cooked in North Indian style. Fresh mixed vegetables cooked in Goan style. Cooked with fresh spinach in gravy. Potato and cauliflower cooked in dry gravy. Potato and eggplant cooked in dry gravy. Roasted eggplant mashed and finished with onions, tomatoes, capsicum and peas. Dumpling of cheese and potatoes stuffed with dry fruits and cooked in korma sauce. Channa dal, red kidney beans and black urad lentils. Chickpeas cooked in North Indian style. Yellow lentils tempered with onions and tomatoes. Basmati rice cooked with dry fruits. Basmati rice and fresh vegetables cooked over slow fire with raisins and nuts. Spicy chicken and rice cooked over slow fire. Spicy lamb and rice cooked over slow fire. Bread cooked in tandoor with dough made from dairy products and fine flour. Bread cooked in tandoor with fresh garlic. Unleavened wholemeal bread stuffed with mixed vegetables. Unleavened wholemeal bread stuffed with potatoes. Naan stuffed with cottage cheese. Naan stuffed with spicy onion, coriander and fresh chilli. Stuffed with minced spicy lamb. Stuffed with coconut and sugar. Homemade yoghurt with fresh tomatoes and cucumber.